Click here to go to the Groundwater Main Page for more information. Current Groundwater information maps are listed by county, categorized by water table, or confined aquifer, with 5 year information. 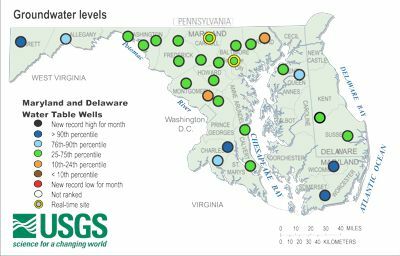 This information is based on monthly readings from selected wells in the MD-DE-DC Water Science Center. View water table well data by county for Maryland and Delaware, or by jurisdiction for Baltimore City and D.C. The Real-Time Groundwater Level Network contains water level data that is typically recorded every 15-60 minutes, and transmitted to USGS offices every few hours. Transmissions may be more frequent during critical events. * Note: This is provisional data and is subject to revision.